Today’s post is by our very own Kate Amrine – she felt inspired to do some end of semester reflecting after seeing so many friends, colleagues and students graduating. 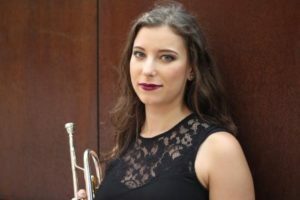 A passionate and creative performer, Kate Amrine is a prominent trumpet player balancing a multifaceted career from developing new repertoire and curating concerts to freelancing with many different groups in the New York City area. Recent performances include a tour of Japan with the New York Symphonic Ensemble, a solo recital in Mississippi at the Music by Women Festival, and an opera at BAM with string ensemble A Far Cry. Upcoming performances include new music with orchestra at Carnegie Hall and the Miller Theater, a workshop of a new off Broadway show by Duncan Sheik, a concerto in her hometown in Maryland, and a concerto and orchestra tour to Japan. Kate is extremely dedicated to commissioning and performing new music, premiering over 30 pieces both as a soloist and a chamber musician. Her debut album was released in November 2017 and features new music by women composers. Kate also frequently performs on Broadway and in other regional musical theater productions both in and outside of the NYC area. As an educator, Kate enjoys teaching in several after school music programs and teaches private trumpet lessons as an Adjunct Instructor at New York University. This is perhaps the most obvious question of them all. I am sure we have all heard this from friends, family, teachers, and even people at the grocery store. But it is super important to think about – even if what you want is “unrealistic.” Thinking about your version of an ideal career can open your eyes up to what is possible, what would be the best case scenario, what you are willing to do to get here, and what you don’t want to be doing at all.. Also, don’t be afraid to think big – what would be the best case scenario for your career – it could be something like winning a job, playing with a certain famous musician, or giving recitals across the country. Similarly, don’t be afraid to think “small” – sometimes what you want to do could be as simple as recording an album in the year after graduating or starting a group with friends. Having goals of different sizes aimed for different points of your career is definitely the way to do it. One more thing about goals – they should be SMART. This stands for Specific, Measurable, Attainable, Relevant, and Timely. So for example, my goal of playing with the New York Pops isn’t a SMART goal because it isn’t something that I have any control of the Time aspect. A goal of making an album of music for kazoo and slide whistle (completely just made this up) is SMART though because all of the factors would be in your control – including what you record, when it is released, who is involved, how you will measure its success, and how it will all come together. 2. Is this aligned with my goals and what I want to be doing? I’m not sure where I first heard this but just to state the obvious, without a plan you’ll end up somewhere that you don’t want to be. I had this experience when I finished my undergrad and I don’t recommend it. Most people when they graduate from music schools with a degree in their instrument come out of school saying something like “I just want to play” or “I’m down to work in any musical scenario.” While you may be eager and these statements may be true for you, hopefully you’ll realize from the previous point that these aren’t SMART goals. Of course we want to take every gig that comes our way – but after a certain point, our time gets more and more valuable and there simply aren’t enough hours in the day. So when faced with these decisions, you will have to answer this question – does this new opportunity align with my goals and what I want to be doing? As I wrote about in my recent blog post, we aren’t always able to make every decision with our goals 100% in mind. Sometimes there may be a situation that comes up where you really want to take a certain gig yet have to stay in and teach because you need the money to cover student loans or your monthly expenses. Being financially stable is a very important goal and definitely shouldn’t be overlooked when going for our musical goals. 3. Who is on your team to help you get there? As a recent graduate, you presumably have good relationships with your teacher, other professors, recent colleagues, friends, and family. These are all people that can help you accomplish your goals. Don’t be afraid to ask for help, bounce ideas off of friends, or have these tough talks with people who are on your side. On the other hand, there may be times that the only person that knows what is best for your career is YOU. Your parents or friends can’t possibly understand everything that you are trying to do in your career or be able to understand and accept tough situations like how taking a low paying gig with a better future opportunity might be better than a short term higher paying gig. There are also many more resources available to help you get where you need to be. Here in New York City, the Musicians Union and Actors Fund both have many career workshops, financial counseling, and other wellness events. I also sought out a coach – Karen Cubides – to help me focus on my career and get everything in order. Don’t be afraid of asking for help when needed! 4. How are you going to leave the scene better than you found it? I realize that this might be a bit of a dark topic to address in a post intended for college graduates but life is short! We aren’t going to be around forever and now is a good time to think about things like the kind of impact you want to make and what would happen if you weren’t alive anymore. I like thinking about it in relation to a campground – that old saying, leave your surroundings cleaner than you found them – it totally applies here. What are you going to do that goes beyond playing gigs and focuses on serving others and making the world a better place? This doesn’t have to be a huge grand gesture because there are many little ways that we can go beyond in the world around us. Things like offering a free masterclass at an organization with financial problems, performing in senior centers, teaching, and so many others – these are all totally doable things that you can try and see what works best for you. How do you want to be remembered? 5. How are you different than everyone else? This is another question that you might have heard before. Many music business and entrepreneurship texts often focus on building up as many skills as possible so that you are “marketable” or “hireable” or filled with added abilities to make you more attractive to work with. These things aren’t wrong – but it can be unrealistic to think about being a master at your instrument, teaching, the technology aspect, and all of these other facets of being a musician. You don’t have to be a Jack or Jill of all trades – but being able to offer a bit more than just someone who can show up and play will help you in the long run. I remember when I was in school someone told us to look around and that the room was filled with our colleagues for life – people who would hire you and be on your side – so we should all be careful how we come across to others, even at a young age. As a recent graduate, hopefully you have already made these smart choices – but if not, no better time like the present 🙂 These people graduating with you are able to hire you when they need someone but also remember they may be your competitors. This goes back to the question – how are you different than everyone else? This goes far beyond how you are in a playing situation and relates much more to how you are personally to work with and everything you completely bring to the table.